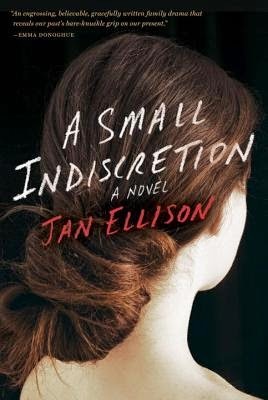 The 28th book I reviewed this year, back in April, was A Small Indiscretion by Jan Ellison. It was an fantastic book, and also an Oprah Book Club Pick. A story of family and how strong the bonds really are when faced with the worst. I really enjoyed it, and now you can try to win a signed copy for yourself. Yes, signed! Jan Ellison is a graduate of Stanford University and San Francisco State University's MFA Program. She has published award-winning short fiction, and was the recipient of a 2007 O. Henry Prize for her first story to appear in print. Her work has also been shortlisted for The Best American Short Stories and the Pushcart Prize. She lives in Northern California with her husband and their four children. A Small Indiscretion is her first book. For more information please visit http://www.janellison.com and follow the author on Facebook and Twitter. A Small Indiscretion fixes an unflinching eye on the power of desire and the danger of obsession as it unfolds the story of one woman's reckoning with a youthful mistake. At nineteen, Annie Black trades a bleak future in her washed-out hometown for a London winter of drinking to oblivion and yearning for deliverance. Some two decades later, she is married to a good man and settled in San Francisco, with a son and two daughters and a successful career designing artistic interior lights. One June morning, a photograph arrives in her mailbox, igniting an old longing and setting off a chain of events that rock the foundations of her marriage and threaten to overturn her family's hard-won happiness. The novel moves back and forth across time between San Francisco in the present and that distant winter in Europe. The two worlds converge and explode when the adult Annie returns to London seeking answers, her indiscretions come to light, and the phone rings with shocking news about her son. Now Annie must fight to save her family by piecing together the mystery of her past -- the fateful collision of liberation and abandon and sexual desire that drew an invisible map of her future. A Small Indiscretion is a riveting debut novel about a woman's search for understanding and forgiveness, a taut exploration of a modern marriage, and of love -- the kind that destroys, and the kind that redeems. **No compensation was received for posting. Freda's Voice is not responsible for prize shipment, lost, damaged or stolen prizes. Opinions are owned by this site.